Α great success and recognition for Microbrewery of Serres and Northern Greece «Siris MicroBrewery» came from abroad. The “Voreia Stout” beer won the bronze medal in the international contest ‘Brussels Beer Challenge’ in the category ‘Stout-Porter Beer’. The competition was successfully held in Antwerp, Belgium, with a total of more than 1,100 beers from around the world competing. 75 distinguished expert οf the beer industry from around the world formed the jury, who tasted and pointed out the best recipes through a blind test procedure. The award ceremony was held on Sunday, November 8th, while on the same day the winning beers were announced on the competition website. The Voreia Stout contains a combination of six different malt barley and pure Greek barley. At the same time, the use of original, French dark chocolate Valrhona is a global innovation that makes the recipe unique. It is non-pasteurized and unfiltered Ale of long ripening, characterized by black coffee creamy foam. Roasted aromas stand out strongly and hints of chocolate, coffee and caramel cooperate harmoniously, adding a special flavor identity. The taste is full, creamy and sweet at first, and a slight acidity is distinguished as chocolate, coffee and caramel emerge, leaving then a strong aftertaste with a quite bitterness of dark chocolate. The beer has sophisticated thickness and density, with fermentation starting with 18 Plato, despite the moderate for the category alcohol concentration of almost 6 volumes. It is available in bottles of 330 ml and ideally combined with veal and pork, barbeque sauce, truffle, cheddar cheese, blue cheese, shellfish and mollusks. Moreover, it can be accompanied by desserts such as chocolate cake, chocolate soufflé or vanilla ice cream. 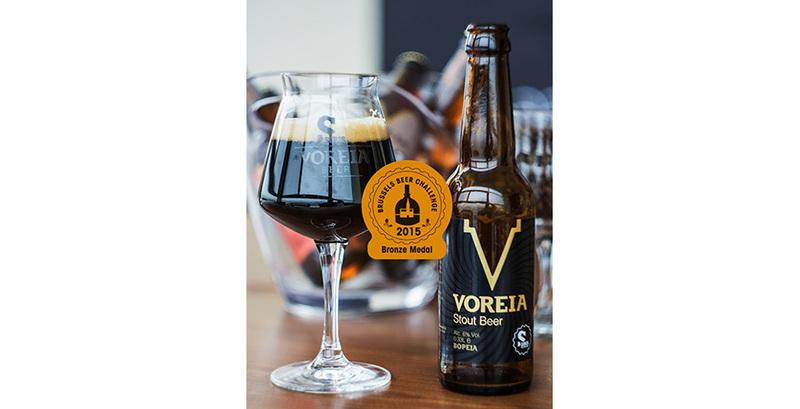 The Voreia Stout beer began its journey in the Greek market in December 2014, receiving outstanding reviews from industry connoisseurs and friends of beer. Shortly after, it was exported along with the other products of our Microbrewery in many European markets, and in the Australian and USA market.